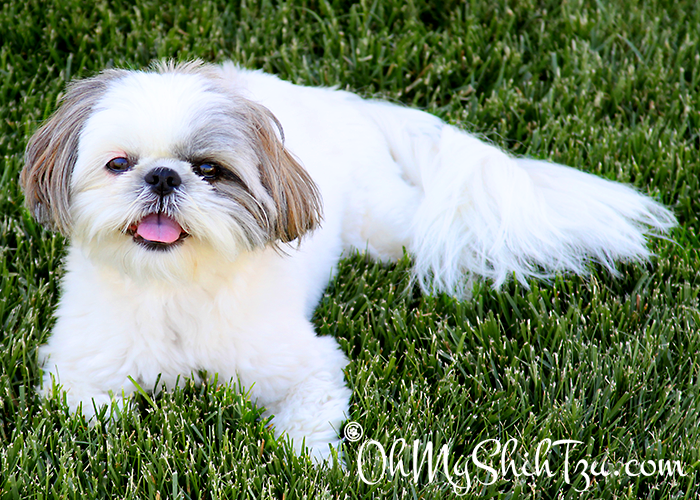 Today’s Super Shih Tzu Saturday Shih Tzu of the week is Izzie! My full name is Queen Isabella; that’s what my ‘rents named me but nobody ever call me that unless they’re really annoyed with me – which is never (okay, almost never). Mostly, my ‘rents call me Iz, or Izzie, or Izaboo. Sometimes, they call me Rowdy Girl or Tornado. I was born on April 1, 2012 (no foolin’ !!) so I am two years old. My favorite food is CHICKEN !! I eat boiled chicken every day with a little bit of boiled chicken liver (dee-LISH). 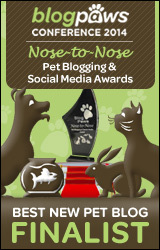 I also like my kibbley dog food – it is trout and potato, and it’s pretty yummy, too. I don’t really like veggies all that much, but I LOVE blueberries. My Dad rolls them across the kitchen floor for me every morning and I chase them down and nom them. We call it bowling for blueberries !! All my toys are my favorite toy at one time or another, and I have sooooo many…. right now, my favorite is my Churkey baby – we can’t decide if it’s a chicken or a turkey, so we call him “Churkey”. I also like my stuffingless fox baby, and my octopus baby (it’s really a rope ball with lots of rope “tentacles” hanging off it – my Dad and I play tug-o-war with it). The place I most like to be is wherever my people are – I just love being with my Mom and Dad, and I never want to be very far away from either one of them. The only time I try to get away from my Dad is when I think we might be going to the V-E-T. If I think I hear that word, I grab the nearest baby, run as fast as I can, and scramble under the bed in the front guest bedroom. When I’m sitting down somewhere and my Dad starts walking towards me, I watch him, and then, I wait until he gets close to me and then, when he gets really, really close to where I am, I flop over on my back so he can give me a tummy rub. I do it all the time. If he walks away from me without rubbing my tummy, I grr at him until he comes back and gives me my tummy rub. My BFF is most definitely my Mom. We do lots of girl stuff together, and we talk about boys. A LOT. If Izzie could talk, we think she would sound a lot like Gwen Stefani. 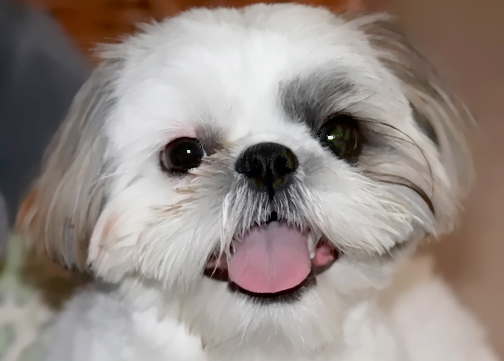 We brought Isabella home in June of 2012 as a playmate for our (then) 2-year-old female Shih Tzu, Zoey. The two quickly became inseparable — Izzie clearly the more outgoing, she was the perfect complement to our more quiet, gentle Zoey. We lost our sweet Zoey very suddenly on Valentine’s Day. We were devastated, and we worried about Izzie — we were so afraid she would be lost without her Zoey — she had never been without companionship. After a few days, however, she seemed to adapt very well (amazingly well, as a matter of fact). ALL the time, and she has not missed a beat since. She is easily the happiest, most joyous Shih Tzu that has ever owned me, and she lives her life out loud every single day. She makes it obvious that she loves me completely and unconditionally. My rowdy girl makes my heart sing every time I see her face, and if that doesn’t make her a Super Shih Tzu, then I don’t know what does. 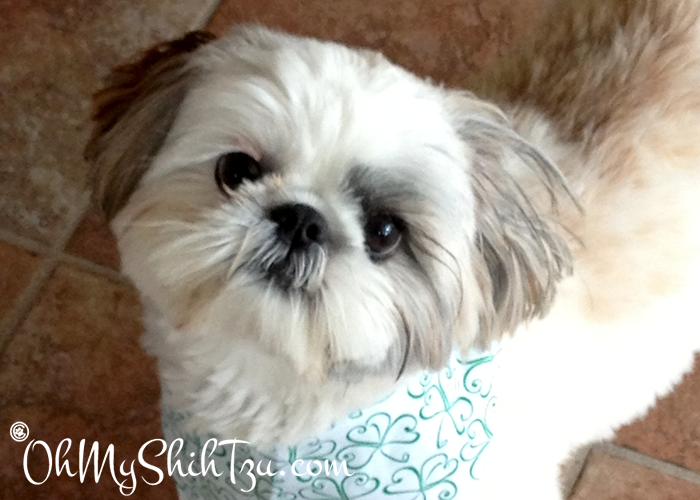 A special Thank You to Debbi Haynes-Jacintho for submitting Izzie as the Super Shih Tzu Saturday Shih Tzu of the Week!